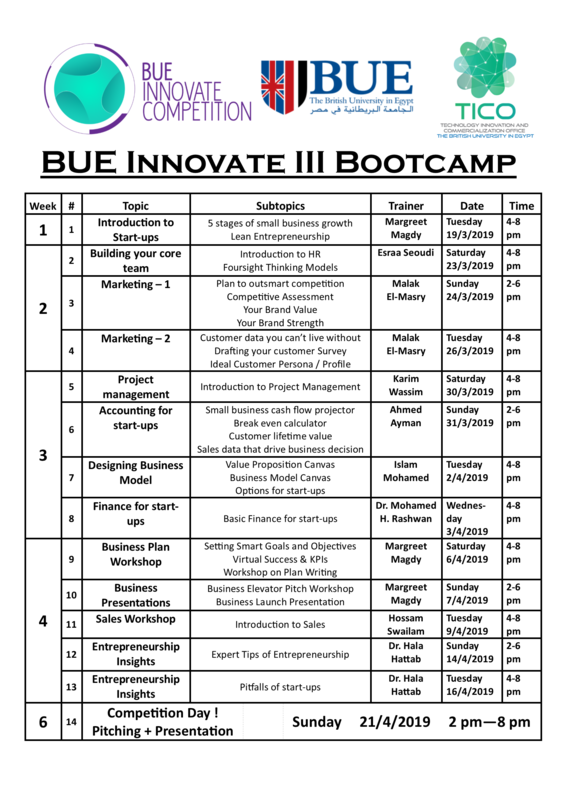 BUE Innovate competition is designed to foster technological and innovative ideas that address societal needs and have market demand into reality. If you have an idea for an invention, a product, a service, an app, or a combination of these! If you want to have your start-up company ready to the world. This is the right place for you to start!! You will get the all the necessary training and mentorship that are customized for you, meet real entrepreneurs and hear from them, access to market. Winning teams will be incubated in BUE Incubator. • Mentorship and Technical Support. • Office space for your company. Please let us know how did you hear about us. Why do you want to join the competition? Describe the problem that you are willing to solve. Describe the problem that your solution will solve. Tell us more about your potential customer and possible ways to reach him/her. Tell us more about your major costs and how you will generate revenue out of the company.